DARK-ROASTED, INTENSELY AROMATIC, RICH AND BOLD: Café La Llave is a bold Latin-style espresso with an intensity level of 11. It is full-bodied, highly aromatic and balanced espresso that will please the senses. COMPATIBLE WITH NESPRESSO ORIGINALLINE BREWERS: specially engineered for Nespresso OriginalLine brewers to deliver a high-quality and consistent espresso, shot after shot. Not compatible with Nespresso Vertuo brewers. *Not affiliated with NESPRESSO. 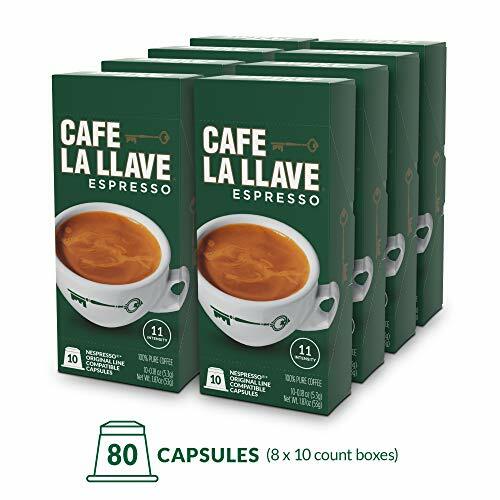 DESIGNED AND SEALED FOR ULTIMATE FLAVOR AND FRESHNESS: our plastic capsules are specially designed to protect and seal in freshness, taste and aroma of the coffee, so you can enjoy a perfectly flavorful and consistent espresso crowned with a honey golden crema. OVER A CENTURY OF Latin TRADITION IN EVERY CAPSULE: enjoy a tazita of Latin style espresso and experience a tradition that began in Cuba more than a century ago. Final Price as low as $32.99 Shipped!